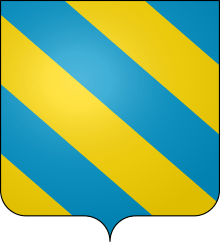 Coat of Arms of the Montefeltro family. Portrait of Federico III da Montefeltro, by Piero della Francesca. Da Montefeltro is the name of an historical Italian family who ruled Urbino and Rimini. The family's reign began in 1226 when Buonconte I da Montefeltro and his brother Taddeo were appointed Counts of Urbino by emperor Frederick II. They and their descendants were leaders of the Ghibellines of the Marche and the Romagna. Buonconte I was succeeded by Montefeltrano II (1214–1255), and Guido I (1255–1286 and 1293–1296), who was captain of Forlì during wars with the French and papal armies. Pope Boniface VIII absolved him from censures for his actions in those wars, and employed him against Palestrina and the Colonna. Guido's successor, Federico I (1296–1322), increased his domains by taking Fano, Osimo, Recanati, Gubbio, Spoleto and Assisi from the Holy See. He was murdered after levying high taxes and Urbino fell under papal control. In 1323, however, Frederico's son Nolfo (1323–1359) was proclaimed lord of Urbino. In 1355, as a papal legate, Cardinal Albornoz travelled through Italy restoring papal authority and Urbino once more came under the control of the Holy See. Nolfo's son, Federico II, was left without any authority, but his son, Antonio II (1377–1403), took advantage of the rebellion of the Marche and Umbria against the Holy See (1375) to restore his authority in Urbino. Guidantonio (1403–1443) was appointed ruler of the Duchy of Spoleto by Pope Martin V (1419) and carried on war against Braccio da Montone with varying fortune. His son, Oddo Antonio, was assassinated after only a few months in power. The Urbinese then offered the lordship to Federico III (1444–1482), the illegitimate son of Guidantonio, a pupil of Vittorino da Feltre's school and a lover of art. Under him Urbino became a cultural center of the Renaissance. He was implicated in the wars against Sigismondo Pandolfo Malatesta and Pope René of Anjou, and Florence. Pope Sixtus IV conferred on him the title of Duke of Urbino (1474). Guidobaldo I (1492–1508) was forced to flee Urbino to escape the armies of Cesare Borgia. He adopted Francesco Maria della Rovere (1508–38), his sister's child, thus uniting the signoria of Sinigaglia with Urbino. He aided Julius II in reconquering the Romagna. Pope Leo X deprived him of his territory, which was given to Lorenzo de' Medici, and later to Francesco Maria della Rovere. This article incorporates text from a publication now in the public domain: Herbermann, Charles, ed. (1913). "Archdiocese of Urbino". Catholic Encyclopedia. New York: Robert Appleton. Wikimedia Commons has media related to Montefeltro.